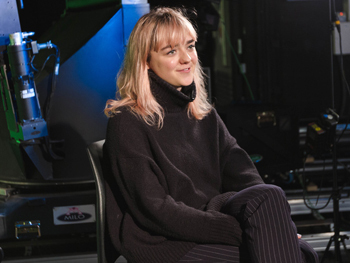 Game of Thrones star Maisie Williams has paid a visit to creative Birmingham students to talk about her new app ‘Daisie’, which aims to connect young professionals breaking into the creative industries. Williams spoke to students at Birmingham City University’s School of Media about the app during a visit to the second city, and gave students her thoughts on how to make their way into sectors like film, fashion, music, photography, art and literature. The Arya Stark actor spoke about the need to help young people find a way into competitive professions and said Daisie was created to provide a platform which connects them with like-minded people to collaborate on new projects. During her visit Williams was given a tour of the University’s facilities including its state-of-the-art media studios and met students operating the newly launched FADE radio station. The visit kicks off the School of Media’s ‘Media Futures’ series, which is focussed on celebrating the skills of its students and championing their role as the next generation of media talent. Media Futures also gives students the opportunity to speak to top industry professionals and gain insight into their careers and experiences.